HomeWhy Should You Stay at Mountain Melodies Hotel in Pigeon Forge? It’s important to stay somewhere where you feel welcome! At Mountain Melodies, our friendly staff will make you feel comfortable throughout your entire stay. From being greeted at the check in desk until the moment you head back home, you’re going to know our staff cares about your stay. We offer affordable accommodations for all of our guests. We want everyone to enjoy a trip to Pigeon Forge without having to break the bank. By saving a little money on the room cost, you will be able to spend a little extra throughout your vacation to explore the area and visit some of the shows and attractions! One of the best parts about our hotel in Pigeon Forge is that it’s within walking distance to the best Pigeon Forge attractions, restaurants and shopping areas. We are located directly on the Parkway in Pigeon Forge and you can step outside our hotel right onto the sidewalk. You’ll love being so close to fun things to do in Pigeon Forge because you’ll be able to quickly and easily visit any place you want. Plus, we have free indoor parking right at our hotel, so you can just park your car and leave it for your stay. You can walk to area restaurants and attractions, or take a ride on PigeonForge’s Fun Time Trolley! Of course, you’re visiting because the Great Smoky Mountains are so beautiful! You can get a great view of the mountains from our hotel, but we’re only a few short minutes from the entrance to the national park, where you can drive and park at a trailhead to hike, explore one of the visitor centers or take a driving tour through Cades Cove! There’s so much to do and see in the mountains – you’ll be able to fill at least a day or two of your vacation spending time in the park. There’s nothing more relaxing than spending time by the pool or in the hot tub after a day of fun in Pigeon Forge. You can make your way back to the hotel, grab your swim gear and head to the pool for a relaxing afternoon. In addition to these great amenities, we offer complimentary breakfast, free WiFi and in-room Jacuzzis and fireplaces. To check out all of our other amenities, click here. 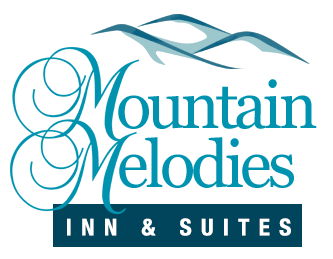 You’ll love staying at Mountain Melodies Inn and Suites, so take a look at the rooms at our hotel in Pigeon Forge and start planning your vacation today!